Be the first to share your favorite memory, photo or story of Earleen. This memorial page is dedicated for family, friends and future generations to celebrate the life of their loved one. 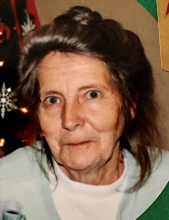 Earleen Wellmon, 80, of Fallston, passed away Friday, April 12, 2019 at Atrium Health - Cleveland in Shelby. She was born in Cleveland County on, May 4, 1938, and was a daughter of the late Tommie Clifton Wellmon and Mabel Brittain Wellmon. She was the owner and operator of Amazing Grace Rest Home since 1970 and was formerly employed with Costner Furniture . Earleen was a member of Friendship United Methodist Church. In addition to her parents she is preceded in death by her brother-in-law, Ray Leonhardt. She is survived by her sister, Margie Wellmon Leonhardt of Lawndale; two nieces, Melanie Leonhardt Wilson and husband Darrell and Kristy Leonhardt both of Lawndale; and a great niece Mackenzie Wilson. The family will receive friends on Tuesday from 6:00 PM to 7:30 PM at Stamey-Tysinger Funeral Home, Fallston. The funeral services will be on Wednesday at 3:00 PM in the Stamey-Tysinger Funeral Home Chapel. The entombment will follow in the Rose Hill Memorial Park Mausoleum. Memorials may be made to Friendship United Methodist Church, PO Box 219, Fallston, NC 28042. Arrangements have been entrusted to Stamey-Tysinger Funeral Home & Cremation Center, Fallston. To send flowers or a remembrance gift to the family of Earleen Wellmon, please visit our Tribute Store. "Email Address" would like to share the life celebration of Earleen Wellmon. Click on the "link" to go to share a favorite memory or leave a condolence message for the family.